Strijker, A. (2004). Reuse of Learning Objects in Context: Human and Technical Aspects. PhD dissertation, Faculty of Behavioural Sciences, University of Twente, Enschede, Netherlands. ISBN 90-365-2090-9 (7.3 Mb). This book is intended for those in education management and consultancy, course design and development involved in the reuse of digital educational material. 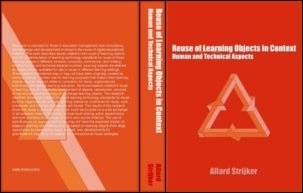 The book describes issues related to the reuse of learning objects and the implementation of learning technology standards for reuse of these learning objects in different contexts (university, commercial, and military) and the human and technical aspects involved. Learning objects are defined as digital entities, available for use or reuse in different learning settings. These objects themselves may or may not have been originally created as learning objects; it is their use for learning purposes that makes them learning objects. Human aspects relate to motivation for reuse, organizational incentives, and applied learning scenarios. Technical aspects related to reuse of learning objects include the development of objects, repositories, services of repositories, and technology to exchange learning objects. The research identified dimensions related to use of learning technology standards for reuse such as organizational cultures, learning scenarios, incentives for reuse, work processes, and how learning objects are stored. The results of the research show that reuse in practice may not so much be focused on a wide exchange of all available material but rather on local level sharing within departments and even primarily on the reuse of one’s own course material. The use of specifications for learning technology may not have the expected impact on adaptive learning and building courses based on learning objects from large repositories as expected by many. Instead, new developments for specifications may focus on support for more-personal reuse strategies.